Moving on is one of the main parts of the life. Most of the people move on in their lives in order to gain success. It is the right of every professional to change his job whenever he gets a better opportunity. Leaving the job is not a major problem but writing a suitable resignation letter is. It is the requirement of your professional life to leave on good terms with your previous employer. The property manager is hired by any company in order to handle the operations related to real estate investment. These professionals are responsible for managing all types of properties. Writing a resignation letter can be a little bit complicated because it sometimes becomes so hard to put your decision in polite and kind words. Telling the employer in the resignation letter that how much you hate the company where you are working right now is not a recommended approach. Writing the resignation letter and giving the notice to the employer helps him in the process of transition. Regardless of your relationship with your employer, you should always be honest with your company and your employer should always be known that when you are departing. 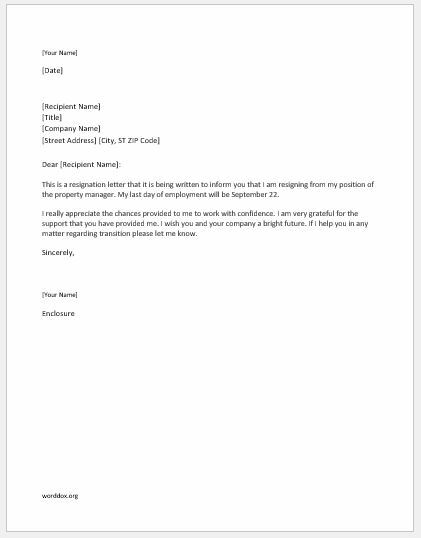 Here is a sample resignation letter for the post of the property manager. The sample will be an inspiration for all those people who want to write a resignation letter for themselves. This sample will help you know about the details to be added in the resignation letter and it will also help you know how to handle the communication through this letter. This is a resignation letter that it is being written to inform you that I am resigning from my position of the property manager. My last day of employment will be September 22. I really appreciate the chances provided to me to work with confidence. I am very grateful for the support that you have provided me. I wish you and your company a bright future. If I help you in any matter regarding transition please let me know.